This NAS solution uses OpenSSH for secure transport over a TCP connection, and NFS to mount the volume on your local computer. The hardware of the NAS server is the low-cost Bifferboard. You must trust the “root” user who mounts the directory! They have full shell access to your NAS. A not-so-strong SSH encryption cipher is used, in order to improve the performance of the SSH transfer. echo "Mounting NFS volume on $HOST:$REMOTEPORT (SSH-key='$SSHKEY')." echo "Forwarding: $HOST: Local port: $LPORT -> Remote port: $port"
sudo mount -t nfs -o noatime,nfsvers=2,proto=tcp,intr,rw,bg,port=61001,mountport=61002 "127.0.0.1:$REMOTEDIR" "$LOCALDIR"
echo "Unmounting NFS volume and closing SSH tunnels." Removed the “rsize=8192,wsize=8192” mount options – they are auto-negotiated by default. Added the “noatime” mount option. Put the SSH username in a variable. Tunneling NFS over SSH « HowtoForge. Categories: Bifferboard, Linux | Tags: Bifferboard, debian, nas, NFS over SSH, openssh, rsnapshot, ssh | Permalink. 💡 Please review the newer tests. 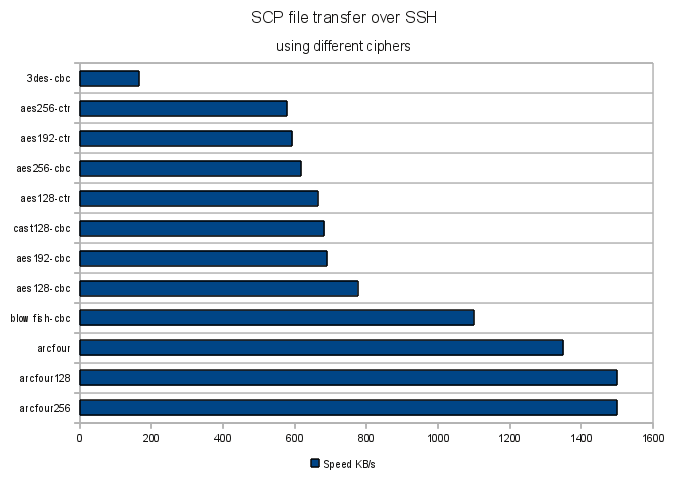 Ever wondered how to save some CPU cycles on a very busy or slow x86 system when it comes to SSH/SCP transfers? 41 MB test file with random data, which cannot be compressed – GZip makes it only 1% smaller. A slow enough system – Bifferboard. Bifferboard CPU power is similar to a Pentium @ 100Mhz. The other system is using a dual-core Core2 Duo @ 2.26GHz, so we consider it fast enough, in order not to influence the results. SCP file transfer over SSH using OpenSSH as server and client. You can review the raw results in the “ssh-cipher-speed-results.txt” file. The delta difference between the one and same benchmark test is within 16%-20%. Not perfect, but still enough for our tests. 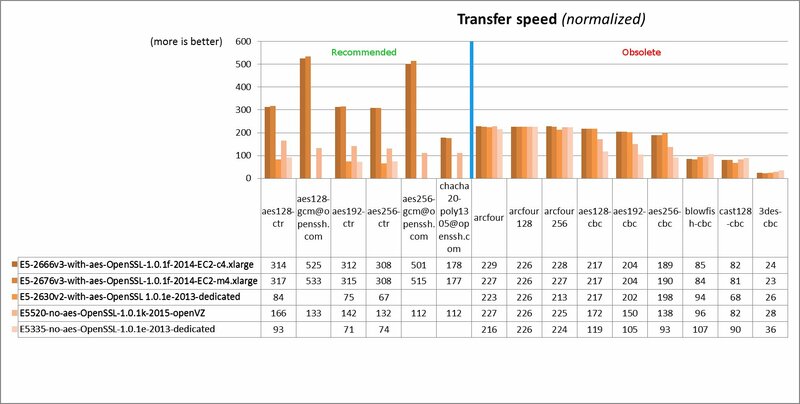 The clear winner is Arcfour, while the slowest are 3DES and AES. Still the question if all OpenSSH ciphers are strong enough to protect your data remains. It’s worth mentioning that the results may be architecture dependent, so test for your platform accordingly. Also take a look at the below comment for the results of the “i7s and 2012 xeons” tests. Categories: Bifferboard, Linux | Tags: benchmark, openssh, ssh | Permalink.